A NEW GIANT CAMEL, TITANOTYLOPUS NEBRASKENSIS, gen. et sp. nov.
Bulletin of the University of Nebraska State Museum 1:36 (May, 1934), pp 291-294. The purpose of this bulletin is to figure and describe a .amel brought to light in the field season of 1933, which seems to be the giant of all camels found in the State. The specimen consists of the right ramus with the symphysial portion. The mandible is 26% inches long, or about the length of one's outstretched arm to the finger tips. This jaw is nine inches longer than that of Camelops kansanus. Such an extraordinary jaw indicates a camel nearly twice as large as Alticamelus altus. In reference to its unusual size we are proposing for it the name Titanotylopus nebraskensis. The teeth are very brachyodont, and the incisors are not spatulate. The dental formula of T-itanotylopus nebraskensis reads as follows: i 3, c 1, p 2, m 3. 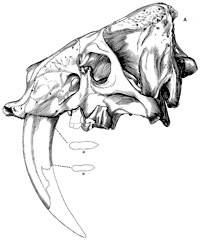 The third incisor was practically aborted as indicated by the small and very shallow alveolus crowded close to the base of the canine. The first left incisor has the enamel preserved on the inner side. It measures but 19 mm. in height. It should be noted that in Pliauchenia the cheek teeth are subbrachyodont to hypsodont; in M egatylopus they are more or less hypsodont; and in Titanotylopus they are distinctly brachyodont. Obviously premolars 1 and 2 have long been missing in this genus for not a vestige of them has been left. Such an assemblage of characters seems well beyond the realm of mere variation, and we find no ready escape from making this a new genus. So few genera of camels are reported as yet from the Pleistocene that Titanotylopus deserves the more attention. This unusual specimen was secured during the first week in September, 1933, by Frank Crabill (Class of 1935), a member of the Morrill Palaeontological Expedition of 1933, but was found, collected, and donated by Mr. and Mrs. S. E. Jensen of Red Cloud who found it in a small pit about eight miles northwest of Red Cloud, Webster County, Nebraska. The exact location of this pit is the N.W.1,4, Sec. 17, T. 2 N., R. 11 W. The jaw was found 33 feet below the surface in Pleistocene gravel of supposed Kansan age, and is accessioned 1-6-9-33, the Nebraska State Museum. The specimen consists of the right ramus of the mandible together with the symphysis intact, the dentition being complete but damaged by exposure.